The Porter Cable 7424XP & 3D HD Flawless Finish Kit contains everything you need to obtain the flawless results you desire for your vehicle�s paint. Featuring the correction capabilities of your favorite 3D HD products, partnered with the best Buff and Shine Polishing Pads for the job and the ever-popular Porter Cable 7424XP, this kit has it all! The Porter Cable 7424XP & 3D HD Flawless Finish Kit will help you achieve flawless gloss and incredible shine! Buff and Shine Flex Edge Grip Dual Action Backing Plates are designed to provide the functionality and durability that you need to accomplish any detailing job. Each backing plate features flex edges that ensure fewer mistakes during the buffing process, making them the ideal choice for all skill sets. Buff and Shine Flex Edge Grip Dual Action Backing Plates provide the perfect connection between pad and polisher! 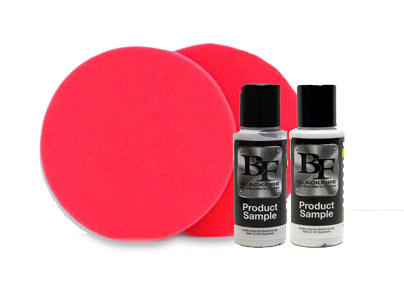 The BUF-500Y Dual Action Backing Plate is the companion backing plate to Buff and Shine 5.5 Inch Flat Foam Pads. This combination is a favorite for many detailers. 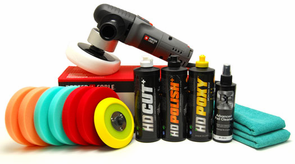 3D High Definition HD Cut Paint Leveling Cream is designed to effectively remove heavy paint defects using a dual action or rotary polisher. This unique non-diminishing formula levels defects quickly without creating dust. 3D HD Cut provides amazing results even with your DA polisher! 3D High Definition HD Polish is the ultimate finishing polish that leaves your vehicle shiny and swirl-free. This unique formulation of nano-technology coupled with super micro-abrasives corrects defects in paint without causing hazing, holograms, or micro-marring. 3D HD Polish is one of easiest to use and most effective polishes on the market today. 3D High Definition HD Poxy is a long-lasting hybrid paint sealant that contains Montan wax. This remarkable formula creates amazing levels of depth, gloss, and shine, especially on black or dark colored vehicles. 3D HD Poxy seals in the shine creating results that last longer than traditional carnauba waxes. A total retail value of $286.86, you save $46.87 off the regular retail price! Additional discounts are not applicable on this item. Please call 877-855-3125 for an expedited shipping quote on this item. Poorboy�s World Natty�s Paste Wax � Blue 8 oz. 3D HD Touch 32 oz.